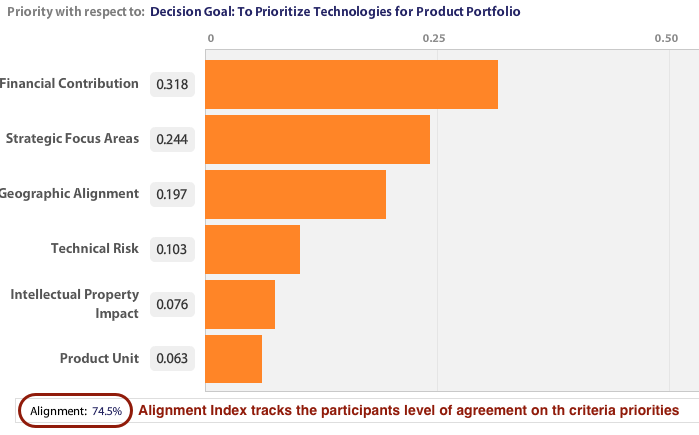 The Alignment is an index value shown as a percentage on the Priority Graph that indicates the level of consensus or agreement between individuals and the overall group in setting priorities. Using the Alignment Index decision participants can quickly identify areas of consensus or divergence. The alignment index is ranges from 0% to 100% where 0% alignment would occur for example when two voters make exact opposite comparisons from one another on every comparison and 100% alignment means they made the exact same judgment on every comparison. The Alignment Index is calculated by taking each individual’s entire set of priorities for all of the elements in the comparison set and comparing that to the group’s priorities. Decision Lens creates a matrix of all of the comparisons across the set of elements for each individual as well as a separate matrix for the group. When viewing the Group output, the Alignment Index indicates the relative level of agreement among Group members' Priorities. (level of agreement voters have from one another). For purposes of displaying this as an Alignment Index, we calculate the differences for all of the individuals as compared to the group, average them, and then make a calculation comparing where the actual result came in as compared with complete alignment at ”1”. We then normalize that on a scale from 0 to 100 where 100 is complete alignment. NOTE: Alignment is not an indicator of accuracy or correctness. The indicator reflects the level of relative agreement among decision makers. How is Alignment Index calculated?